Radha Thomas, originally from India, is jazz and blues singer who trained in Dhrupad, an Indian classical vocal style, with Ustad Farid Ud Din Dagar. Her fluency in switching between genres is unique and has made her popular. 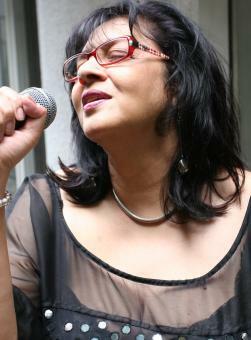 She is considered to be one of the foremost indie / jazz vocalists in India. She lived in New York for twenty years, performing extensively with musicians such as Ryo Kawasaki, Frank Tusa, John Scofield, Michael Brecker, Alex Blake, Badal Roy, Buddy Williams, Joe Farrell and others, showcasing her music at popular venues. Back in India, she collaborated with leading Indian jazz musicians such as Louiz Banks, Amit Heri, Sanjay Divecha, Keith Peters and many others. She has led bands at all major Indian jazz festivals including Jazz Yatra, ICCR Delhi International Festival, Indigo & Blues Festival, Bangalore International Arts Festival, Bengaluru Habba, iSai Festival, goMad Festival and others, besides gigging all over India. - UNK: The Radha Thomas Ensemble: Her regular six-piece band in India has performed regularly over the past 4 years to great success. Of her first solo album called ‘I Only Have Eyes For You’ with her band UNK: The Radha Thomas Ensemble, being played on the radio all over the USA. She is also an author, with debut novel ‘Men On My Mind’ published in 2012. Her second novel was published in 2014. She lives in Bangalore. She is an American citizen.